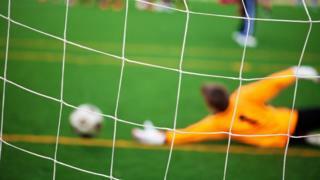 Five-a-side football firm Goals Soccer Centres has uncovered "substantial" VAT errors totalling £12m so far, but has warned the final cost is not yet known. It said the mistake went back "several years" and it needed more details to establish the full cost of the blunder. The new VAT accounting policies it will now need to adopt "may have an impact on future profitability", Goals warned. Shares have been suspended because the error could lead to "a material change" in its financial position, it said. The firm, which operates 50 outdoor football centres in the UK and California, says it plans to enter into discussions with HMRC immediately. "The value associated with these errors is still to be finalised but remains significant," it said. The group added it would make "further announcements in due course as the results of the investigation become known". The news will be a blow for Sports Direct boss Mike Ashley, who owns more than 18% of the firm. The revelation comes after Goals admitted earlier this month that it had discovered accounting errors. At the time, it said full-year results - originally due to come out on 12 March - would be "materially below" expectations and delayed their publication. However, on Wednesday it said trading since 8 March had been strong in both the UK and US. It has been a torrid year for Goals. In January, the East Kilbride-based firm warned on profits after it said that selling food and drink, and offering children's birthday parties, had increased costs as it had to hire more staff. In spite of this, it had still estimated profit for 2018 of between £4.3m to £4.5m, figures which are now in question.